Founded in 1946, Thermo Products boasts a 70-plus year heritage of superior workmanship, product innovation and small town work ethic. Thermo Products has listened to customers’ concerns about comfort and has met their demands for the best, most reliable, and efficient furnaces. 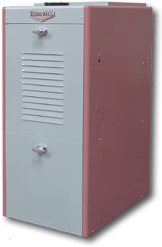 The OH6 Oil Furnace is a durable high performer that takes up little space. 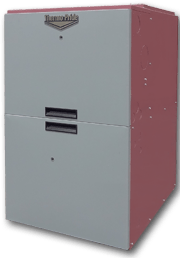 If you have limited space, the low profile OH6 oil furnace is ideal. You’ll be sure to receive quiet, reliable, long lasting performance. The OH6 Premiere Series is offered with a ECM blower motor for increased energy savings. Designed to fit nicely in your low ceiling basement since it is 11” shorter than a typical highboy furnace. Energy Star Qualified – The OH6 Premiere Series is Energy Star qualified. Products that have earned the Energy Star are designed to protect the environment through superior energy efficiency. All Thermo Pride products are hand built and made in the U.S.A. There are many heating solutions to choose from. We recommend the CLHS1 Series for its high performance. 95% AFUE with single-stage uniform heating cycle. Designed for direct vent applications. Condensing furnaces use a second heat exchanger to reclaim some of the heat that is lost in the form of water vapor. The water vapor in the exhaust is condensed, releasing additional useable heat, and lowering the exhaust temperature to the point where it can be vented outdoors via pvc pipe. Multi-speed direct drive blower motors allow the selection of the proper blower speed for quiet operation. Available in upflow and counterflow/horizontal configurations.